The Denison Community Association responds to social and environmental needs by building relationships with those around us while promoting reciprocal learning, personal growth, and lifelong commitment to community, direct service, and responsible stewardship. This includes actively recruiting students, faculty, and staff for the purpose of serving the community. For further inquiry or questions, please contact dcacabinet@denison.edu. DCA committees volunteer in a variety of different organizations, and each committee is unique in the issues they focus on and the ways in which they volunteer. Most of the service work that occurs on campus takes place through a DCA committee. Anyone is able to join a DCA committee at any time, whether that's halfway through the year or during the involvement fair at the beginning of the school year. After School Mentoring and Tutoring focuses on mentorship and improving the classroom performance of children in after-school programs. The group works to enhance study skills, increase proficiency test scores, model positive academic attitudes, and encourage an interest in achieving academic excellence. We work directly with the Licking County American Red Cross to organize blood drives on Denison's campus. Volunteers work on four blood drives annually, helping with publicity and campus outreach. The committee asks for strong commitment and involvement during the week leading up to the blood drive and has minimal obligations during the time between drives. The mission of Big Brothers Big Sisters of Licking and Perry Counties is to develop confident, competent, and caring youth through professionally supported, one-on-one relationships with caring mentors. In the “Lunch Buddies” program, college students are matched with an elementary school child and meet with their “Littles” once a week. All contact takes place on school grounds. With their Littles, they will help develop reading skills, tutor as needed, and be a friend to a child in need of a caring role model and mentor. BreakAway is a national organization that gives young men and women the chance to serve in different capacities in varying cities across the United States. Denison's BreakAway Chapter offers several week-long service trips during the last week of Winter Break. Prior to the trips taking off, students spend time with their group leaders and group members discussing their topic, location, service-learning, and preparing for their direct service in the communities they will serve. The trip topics in recent years have covered topics such as Education, Economics, and Civil Rights in the 21st Century. Students have a unique chance to leave Denison and Granville to delve into some of the most pressing issues of our generation hands on. Companions is a group of volunteers who spend their Friday afternoons from 3:00-4:30 building mentoring relationships with middle school students. These students come from a variety of social and economical backgrounds. Many have dealt with very difficult issues already in their lives. Through the relationships we build, we hope to give the students a chance to talk about their lives, and to, ultimately, increase positive and creative thinking at home and at school. Volunteers develop relationships with Newark-area troops in need of leadership assistance. Volunteers help plan activities for Brownie and Junior scouts that assists in their badge work as well as increasing girls' knowledge and confidence. The activities bring the girls onto Denison's campus and include diverse projects from art projects to science experiments. The Denison chapter of Habitat for Humanity works with the international organization in its mission to alleviate homelessness from the world, and to make decent shelter accessible to people of all backgrounds, races and religions. Our volunteers are involved in local renovation and building, as well as a winter break work trip, and work in partnership with the families in need. HnH provides opportunities for ongoing service and holds an awareness week in November. We regularly collect items from residence halls for distribution in local agencies and transport meals donated from our dining halls to be served in community shelters. Volunteers are sent to an area pre-school and help with therapy sessions and in classes for children with autism spectrum disorder (ASD). Volunteers provide social interactions for the children, as well as extra help to teachers who are working with integrated classrooms (classrooms with both children with ASD and typically developing children). The mission of the DCA H.O.P.E (Helping Other People Eat) Kitchen is to recycle unused food and use existing resources from campus and the surrounding community to cook and distribute meals to local organizations. Medical Volunteers are committed to preserving the quality and dignity of life by offering physical and emotional care based on the highest standards. Volunteers work at the inpatient unit at Licking Memorial Hospital to staff the volunteer desk, talk with patients and families, and simply provide a listening ear or comforting presence for someone in need. Working at the administrative offices or on group projects is also an option for those less inclined to work in a hospital setting. Working with the Licking County Homeward Bound Humane Society, we go weekly to assist the shelter’s regular staff with the animals. We also help fund-raise and plan annual events. We work with South Eastern Ohio Legal Services, which helps low-income citizens with legal problems. Jobs include: guiding attorneys with routine tasks, legal research, courthouse errands and document drafting. Weekly participation is required. We visit local nursing homes once or twice a week. 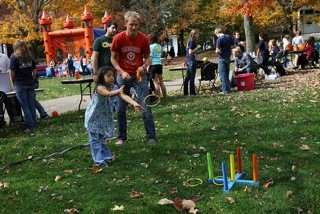 We play games and visit with the residents, or take them on outings to local places such as the pumpkin patch. New Beginnings is a battered women’s shelter in Newark. Student volunteers spend time with children while their mothers attend support groups, court hearings, or other appointments in order to rebuild their lives. Volunteers also take children to activities on the weekends, such as bowling, swimming, or a local park. Volunteers should be patient and enthusiastic about playing with children. We are also looking for male volunteers to model positive behaviors to young boys who oftentimes do not have other positive male role models. Pop Tabs supports the Ronald McDonald House Charities of Central Ohio. The Ronald McDonald House is a place where families with sick children stay when their child is in the hospital, providing a home away from home during a difficult time in their lives as well as the support of other families who are going through similar situations. Our group volunteers at the house in downtown Columbus, cooking dinners for families or helping the staff clean living spaces. We also collect pop tabs on campus to help raise money and awareness for the charity. DVP is an innovative, thoughtful organization funding the efforts of non-profits doing great work in our local community. We invite Licking County organizations to identify the way they would use grant funds to build their capacity to serve the community. We then evaluate their proposals and conduct careful appraisals of the organizations in order to determine which we believe will optimize the use of the funds we can make available. Our process requires us to develop and exercise the skills of analysis, advocacy and public presentation. Every year DCA, in association with the Alford Community Leadership & Involvement Center, organizes a series of service projects that promote community engagement. These projects are a collaboration between DCA and organizations in the Granville and Newark communities, featuring on and off campus events. Volunteers are not required to have previous involvement in DCA, and these events are open to all Denison students, faculty and staff. 9/11 Day of Service — The first service event of the year, the 9/11 Day of Service is designed to make students aware of the importance of community building in the world today. Honoring the tragedy of September 11th this day of service seeks to bring people together and help build a better community. Volunteers participate in a variety of community-based projects during the day, ranging from gardening to a community cleanup on the nearby Licking River. In the evening, DCA will pair with the Licking County Memorial Hospital to host a family movie night on Denison’s South Quad. Make a Difference Day (MADD) — A national day of service, MADD seeks to bring the community together on Denison's campus by hosting events for area families at the university. DCA will again collaborate with Kappa Kappa Gamma to present Make a Difference Day, featuring the Call to College and Kappa Karnival. Children from low-income areas in the surrounding Licking County community will experience a tour of campus to visit residence halls, athletic facilities and experience all that a college education has to offer. The tour will end at Kappa Karnival, a carnival-themed event where student organizations host educational booths and activities for members of the Licking County and Granville community. The Karnival will feature student performances, live music, and more. Big Red's Big Day (BRBD) — This Denison-inspired event exposes the university community to the greater central Ohio area through hands-on service and the annual Health and Fitness Fest at the Newark YMCA. In the past, these service activities included DCA volunteers’ participation in a voter registration campaign and preparation of a community garden for the growing season. Health and Fitness Fest volunteers present health-themed activities, partake in a blood drive, and engage with children at the event to promote healthy lifestyles. First-Year Service Project — At the beginning of each school year, first-year students have the opportunity to volunteer for the afternoon within the Licking County area. The First-Year Service Project allows new Denison students to discover different DCA committees they can become involved with while serving alongside upperclassmen at various locations. Saturday Service exists for students who want to volunteer, but don’t have time for a weekly commitment. Every Saturday, DCA cabinet members go out and volunteer at a different site for a few hours. Students do not need to be a part of an organization to participate.